Last comment was posted 3 hours, 4 minutes ago. And those are only a sprinkling of the various tasty cocktails in Difford’s Guide. Oh … what was that? I’m sorry. That’s just from the “A” section of the book. So, I opened to the first two pages and proceeded to make delicious drink after delicious drink (none with vodka). Then I began browsing with more determination only to find quality ingredients, great brand recommendations, and correct techniques. Unique flavor combinations that I had never experienced before oozed out of every page. Yes, even the shots, which usually I am not a fan of, were succulent. Did I mention that the recipes are spot-on and tasty? I now officially feel like one of those Amazon reviews where you wonder if the author of the book signed in with an alias to plug his book. I told everyone to go out and buy Esquire Drinks, and now I’d like to create an itch in your back pocket for Difford’s Guide. This book has already brought me much joy, and I haven’t even made it to the B’s yet. 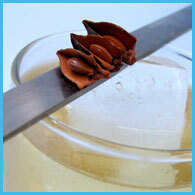 Shake with ice, and strain into an ice-filled glass. Layer in order. Light the rum aflame, extinguish (or not if you’re intense), and down it. 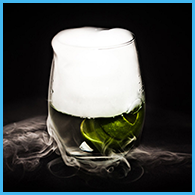 Can shots be high art when it comes to cocktails and fine drinking? If snail porridge and sardine sorbet (a la Fat Duck) can be high culinary art, then certainly shots can. But when the height of the art is “wow, that tasted like Dr Pepper” or “good thing I drank that fast enough that the cream didn’t curdle”, not so much. 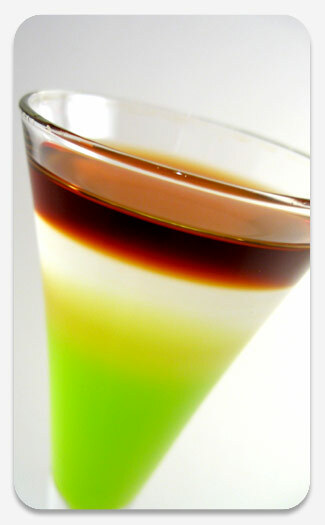 So maybe not a shot, but what about a layered aperitif that changes and mixes flavors as the layers fall apart as the drinker consumes it? For crude example, I used to like the Poor Man’s Black Velvet because the Guinness would slowly give way to the sweetness of the cider. And some like the B-52 certainly look pretty. Oh, and is the Raynal brandy VS or VSOP? The VSOP is $17 and the only one carried in Oregon. “The Acapulco” looks right up my alley, and “The Awol” doesn’t look half bad either. I just need to get some tequila…there hasn’t been any around the house since the last Jimmy Buffett concert! I’ve been buying the periodical version of Diffords Guide that come out quarterly. I think what they do is collect all the material from the periodical to compile the annual volumes. Anyway, I dig it a lot for all the same reasons you cite, but I think I’ve missed an issue somewhere. I’ll probably just switch over to getting the annual every year instead of the quarterlies. How new is each annual? I notice that some drinks are labeled “updated.” Does that mean that all the other ones are new? I couldn’t find an explanation of the rating system either. I assume the more dots the better, but the colors threw me off. And what about drinks with no rating? The Raynal was VSOP and happily only $10. Have you tried it? I’m not sure if the annual hardback contains all the content from the softback or not. My favorite features were the bartender features from 5.1 and 5.2, so I picked up the softbacks. Unfortunately, they didn’t continue the bartender profiles beyond 5.2, and switched to bar recommendations instead. I’m also not sure if they’re going to issue more softback cocktail guides this year or not. Through the alphabet one more time? Anyone know? My only real complaint about the Difford’s guides would be the liberties they take with classic recipes. Some of them end up pretty far from the original cocktails. It’s also really apparent that the spirits brands mentioned in recipes are advertisers, which bugs me a bit, when it comes to looking to the guide for honest opinions. Also, be aware the Bols products we get in the states have very little to do with those they get in Europe. Yes, it is a shame that liqueurs in general are extremely poor in the U.S. Every time I walk through that isle in the liquor store, it makes me sad. They carry zero good brands. I haven’t tried the Raynal. In WA and OR, it’s $16 or $17, and in WA the taxes alone are $5. Still worth it at that price? In VA, it’s $14. Where’s it $10? Just noticed the posts regarding my book â€˜diffordsguide to Cocktailsâ€™ and so thought I answer some of the questions raised. Last year in Oct we published vol. 6 of â€˜diffordsguide to Cocktailsâ€™ which is a considerable improvement on vol.5. I have personally made all 2,000 cocktails in volume 6 whereas I had only made the ones with a grade above in volume 5. We have not renewed our sponsorship agreement with Bols or some other spirits brands for the very reasons sited in this thread. We publish a softback guide every quarter with 500 cocktails between various letters in the alphabet. We guarantee over 100 new drinks in each edition. We also review bars around the world and feature reviews on a spirits category in each issue. We are bringing back the bartender profiles due to popular demand. We have dropped the numbering system on the quarterlies and the issue currently being printed is â€˜diffordsguide Quarterly Spring 07â€™. 2000 cocktail made and tried? You sir, have my respect and admiration. Though, it does put a slight damper on my enthusiasm for being on target to beat Mencken’s claim of having tried 400 (or so) cocktails. I’m looking forward to more diffordsguides in the coming year! Thanks for the responses. I looked on Amazon.com and wasn’t able to find Volume 6 of the guide – is it not available in the States yet? I sent an email via the US source for your quarterly issue and haven’t received a response – did I go through the wrong venue? I would obviously grab all of them plus the annual if it were possible. It was the VSOP for $10 on sale – normally $13. PA can be very cheap, yet its selection can be very poor. I’m growing to like the Raynal for mixing, but that my be my wallet talking over my palette. I dunno if shots are about high art for me as much as ingenious art: unlikely and inspired combinations that work best as a burst. They’re novelties. I make them for larger cocktail parties for special occasions, when I want a sense of lightness and fun. And I avoid the “Gee, this tastes like chocolate cherries” recipes as a matter of course.